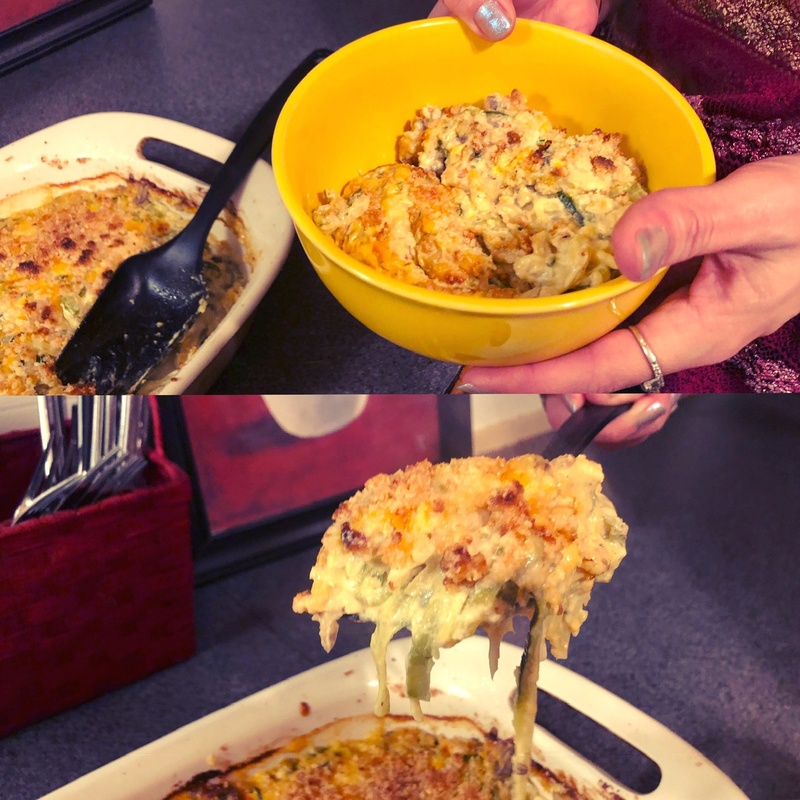 This week we bring you a ketofied version of the Grand Daddy of all Casseroles the Tuna Casserole, but of course we made it Keto and Low Carb safe. So the Tuna Casserole has been around since the 1930, and it looks like it may have originated from our neck of the woods, the Pacific Northwest. Although it quickly migrated across the country and then became really associated with the Mid-West. Casseroles became popular in the U.S. in the 1950 because they were easy to make with generally household ingredients that were easy to find and inexpensive. I personally don’t recall having Tuna Casserole growing up in Washington D.C., but Sarah remembers it well from her childhood in Idaho. In our version we substitute the high-carb ingredients such as potato chips for the topping, or even bread crumbs. We also left out the traditional egg noodles, and cream of mushroom or celery soups. Our version instead uses whole food ingredients from has Heavy cream, Zucchini noodles, albacore tuna packed in water, and shredded cheese. 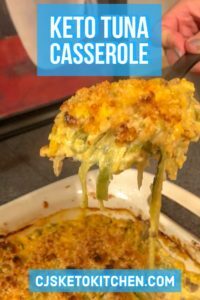 Casseroles normally taste better has they set, and this one was no different. We probably got 8 – 10 servings from this dish and of course that depends on how big your servings are. This is another one of those dishes that you could probably get the whole family to enjoy, and it was pretty easy to make for a week night. We hope that you enjoy it. 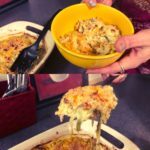 Here is a Ketofied version of the Grand Daddy of all Casseroles, the Tuna Casserole. 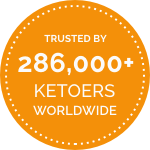 But this version is Keto and low carb safe. It’s delicious, simple, to make and made with whole food ingredients. It’s a dish the entire family will enjoy. 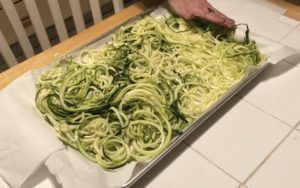 Spiralize and sweat your zucchini for 30 minutes (demo in video). After 30 minutes wring well to dry. Sauté onions, celery and mushrooms using 2 tbsp of butter untitled softened. Set aside. Combine sour cream and mayo. Season to taste and mix well. Add flaked drained tuna into sour cream and mayo mixture and incorporate well. Pour tuna sauce mixture over your zucchini in a 9x13 Casserole dish. Add your sautéed vegetables. Combine well. Add in your 4 oz of Shredded Cheddar cheese and stir well to incorporate. In separate bowl add 1/2 cup of blanched almond flour, and 4 oz. 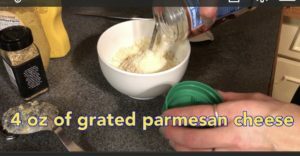 of grated Parmesan cheese and mix together well. Breaking up all of the clumps in the flour. Add 2 tbsp of melted butter to your flour and cheese mixture and mix well. As you mix this will form a crumble. 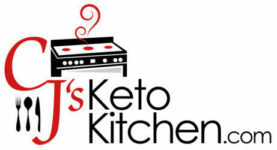 Sprinkle your keto breadcrumbs over the top of your casserole. Bake for 30 - 45 minutes (check often). Bake until golden brown. Optional Step: After your Tuna Casserole is baked through, broil the top of the casserole for 1 - 2 minutes to make your bread crumbs golden brown. 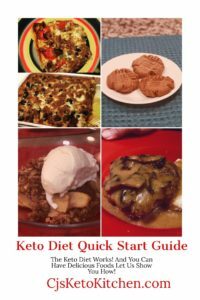 I absolutely love your site and your recipes! 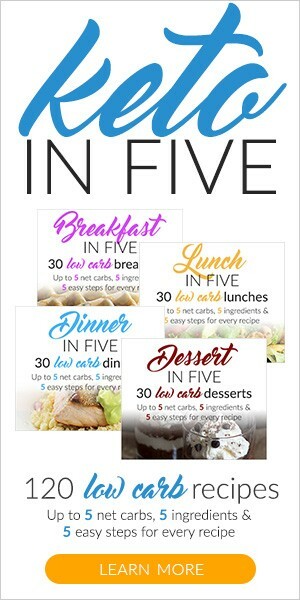 Me and my family of 5 love this very much thanks for sharing this recipe. Your welcome and glad your enjoying it. I made this and it was yummy. Thanks so much for the recipe!